We are restoring a 1938 wide front Silver King and need a steering wheel. Any source for info will be appreciated. We did find a site ebay or amazon store that had John or John s store, but now cannot find it. Please! Any help! I,m rehabbing my grandfathers R-38 and need one of the rear wheel cast centers, the one with nuts and clips ti hold the rim on. Also need a rear pto shaft. I have a wide frontend Silver King. It has spoked wheels. I'm told this is a 1938. I need alot of info. on this because I want to restore this to original as possible. Any pictures of one would be great. I have a picture of a 1940.
looking for parts and or help with a 1934 plymouth. need rear & FRONT RIMS. GASS TANK, OR METAL WHEELS? I have 1944 or 1945 three wheel Silver King with Continental engine # f162-36846 can I cross reference this # with the tractor serial #, also does anyone restore the steering wheels. Engine is original, never replaced, thank you for any info. My son (Rick) and I purchased a 1937 Silver King model R44 Oct 2002.Tractor was not runnig.Cleaned the carb, point ,installed new plug wires. Runs great, no somke.Do have a problem with the clutch. Can not get the tractor in gear.Have not worked on it due to the cold weather.The sheet metal is in very good condition, was keep in a barn.It is very tight I don't think it has many hour on it.Has original rear tires with diamomd tread, very poor condition.This was an estate sale and the man son claims his father purchased the tractor in 1950. He used it to pull a set of gang mowers.I also got the plow with the tractor, 16 inch one bottom. I need a drawbar for the tractor. I want to replace the rear tires and use the tractor to pull at the area shows. Am looking for Silver King owners who have a web page, or are interested in creating a page for the Silver Kings of Yesteryear tractor club. Please note that you saw this on "YT". Thanks. 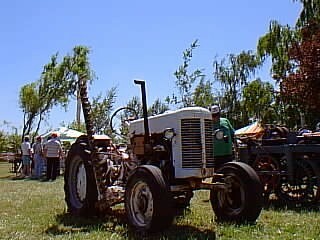 The "Plymouth" tractor was first built in 1934, the name was later changed to Silver King,in 1935. Walter Chrysler had just introduced his automobile Plymouth, in 1928 and was not to happy with a tractor with the same name,Altho it's not known whether the name change was forced upon them?? The Plymouth car was very good with hydraulic brakes for and economy car in the 1930's to bad the name is sceduled to be dropped from the Chrysler line in 2001 model year.The Plymouth tractor remains a very rare collectable tractor today, with the Silver King being more commonly found. we just got me one of these(a R-38?)!!! have been trying to find out what modle she is, and what color she was painted! She was used in Portland, Oregon area to mow the highways. Mine is a 1940, by serial no., but friend said her grill may be a 1941, go figure! Anyone out there with info can get back to me to. My father may have the smaller brother of this tractor. It also was made by Fate-Root-Heath, but it actually carries the "Plymouth" marque. It's about a 1932, still on original rear rubber, and has a Hercules engine. We've been trying to find info on his, and yours may be the best lead-in I've come across.